Lee: Hello and welcome to the third episode of the Hyper Wellbeing podcast. On today’s show we have Ivor Cummins. Ivor is a top class engineer with over 25 years’ experience. His specialty is leading teams in complex problem-solving efforts. 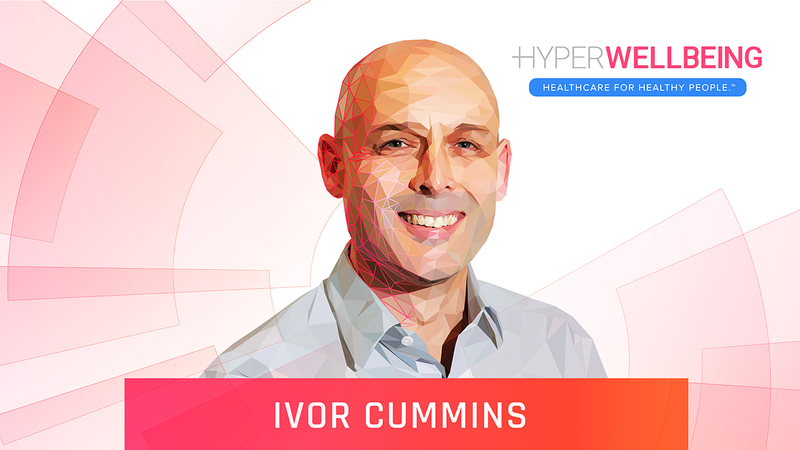 Over the past six years, Ivor has applied his technical expertise to decoding the causes of human chronic disease and obesity. He has analyzed countless scientific publications from the past century creating a strategy to achieve human health, weight loss and longevity. Lee: Ivor speaks at conferences and conducts seminars around the world to provide actionable plans for preventing and healing chronic disease. In 2018, he published, along with Dr. Jeffry Gerber, Eat Rich, Live Strong, Mastering the Low Carb and Keto Spectrum for Weight Loss and Longevity. The book and much of Ivor’s other work is supported by Dave Bobbett and Irish Heart Disease Awareness. Hello, Ivor. Ivor: Hello, Lee. It’s great to be here. Lee: Much appreciated. That sounds a more local accent to what I’m used to. So where are you just now? Ivor: I am in Dublin, Ireland, in my little office. Ivor: Well, at least it’s not raining today particularly. Lee: It’s good to hear a voice that sounds more homely for me. I think I’ve lost a lot my accent, what do you think? Ivor: It’s still there to me, but maybe it’s less strong than it would have been in the past, I’m guessing. Lee: Yeah, I think so too. Anyway, I’ve got so much to cover with you and I know your time’s quite tight so I better start dancing around some topics I want to cover with you. Lee: First of all, I would like to start with the fact that you’ve came from outside of medicine and outside medical practice, you came from engineering. If you could describe where you’ve come from in terms of discipline, and why you ended up in this space, please? Ivor: So, long story short, I got some blood tests in 2012, routine, and two or three readings were really high. I quizzed the doctor about these because I saw the readings and realized I was way outside the normal distribution and way up in the tail. I didn’t get a satisfactory answer to two key questions in any potential problem: (a) what are the implications for serious issues due to these high readings, the morbidity or the mortality down the road? And (b) what root causes in humans would cause these high readings? So, things I can fix to resolve the issue. And I got very woolly answers. Ivor: So, after going to two more doctors including a very senior person and still not getting answers, I realized, wow, this is like my work world. When I’m brought into a team and they don’t have the answers or any clarity, there’s only one path forward. Go to the raw data, and that’s exactly what I did. I went to ResearchGate and got a log-on through my corporation, to PubMed, and I basically pursued these three blood tests, and I studied deeply all of the biochemistry and metabolic science around them. Within a matter of weeks of obsessive study I essentially had my answer: that excessive carbohydrate in my diet was a primary root cause. When I took out most of the carbohydrate in a knife edge switch, within six to eight weeks I lost over 30 pounds in weight and my bloods essentially all resolved, and in fact, all the other bloods became much better, too. Ivor: So, I had crisply demonstrated a root cause intervention with crisp, dramatic, positive results, and then I went on to study for the following many years and I built up a network around the world of professors, doctors and researchers and eventually published my book, and I keep going. Lee: Hey, well done, Ivor. We have a little bit of a similar story. I’ll maybe relate some today, maybe not, maybe do it in a future show, we’ll see. Which readings were high? Ivor: Cholesterol. Not massively high but pretty high, around 6.6 millimole [mmol/L], which would be around 270 milligrams [more precisely 255 mg/dl]. The other one that was really high was GGT, which is a liver enzyme: Gamma-Glutamyl Transferase, and I soon discovered that that was a serious risk marker, much more important than cholesterol; and my serum ferritin, the iron loading in the blood was extremely high also. After getting tested for hemochromatosis, which was negative, I realized with research that it was also an amazing marker for metabolic syndrome. It indicated inflammatory processes in the body and it was a major risk factor for future heart disease and all-cause mortality. Lee: Were you a little bit shocked that the doctor couldn’t help you very much? Ivor: I was actually quite shocked. Especially as I researched and found the answers, it amazed me that these standard blood tests were not on the tip of their tongue, as in, “You got a high ferritin? Well, that can be hemochromatosis, but it can also be an extremely good inflammatory marker and it could relate to dietary issues and metabolic syndrome, and insulin-resistant syndrome.” Likewise GGT, they mentioned “Maybe you’re drinking too much wine.” Because the doctors all understand GGT as a marker of excessive alcohol intake, which in fairness it is, but they’re missing the elephant in the room. GGT is a massive marker for excessive carbohydrate sugars in the diet and being on the path to Type 2 diabetes, independent of alcohol. In fact, GGT is much more important, I would say, in the latter area than in the generic alcohol marker area. Lee: We’re maybe jumping a little ahead, in fact, we are, but I have to ask about AST and ALT in that picture of the liver. Ivor: Yeah, AST and ALT are also can be indicators of liver inflammatory issues, and Alk Phos as well for alcohol, excessive, and there can be a little more specific two issues. GGT is a very general marker, and that’s one of the reasons they’re not crazy about GGT. Even though I find it more useful, it doesn’t give a very specific indication as to what’s wrong besides alcohol, whereas the reality is GGT is just an excellent marker full stop. Lee: It’s a bit like hs-CRP in that it’s not very specific, but I still find it a very useful marker for people who wish to be proactive, whereas doctors tend not to like CRP, let alone … well, they can’t don’t like hs-CRP as a general inflammatory marker because it doesn’t tell them specifically what’s wrong, so they don’t think they can do something with the patient. Ivor: Exactly, and it speaks to one of the problems in modern medicine, that for me in engineering, the best marker with the most impact is the most important measurement. It’s your job to find out why the marker is high, but I think modern medicine leans very heavily towards wanting a specific marker that indicates which medication may be needed, and that’s a weakness. The expert problem solver needs the best markers, and that doesn’t necessarily mean that they’re very specific. That’s the job of the problem solver, to dig deeper. Lee: We’re certainly in agreement. I come from a computer science and electrical engineering background, and I liked hs-CRP because hey, if I consider it high, and actually most will say high is above one [mg/L], but for me I would say it’s anything close to 1 [mg/L]. So when I got mine done it was 0.9, and then I was quite happy to see 0.9 [mg/L] because I’m like, hey look, I don’t think something is as perfect as it could be. So I’ve got sub-clinical inflammation, so now I have the opportunity to investigate myself instead of leaving it there for decades and something could be brewing. Lee: So I took a guess. I went to the dentist, got an X-ray, and is actually sub-clinical inflammation in my gum. I got an operation, they drilled into the gums, they physically removed inflammation, I retested hs-CRP and it dropped to 0.4 [mg/L]. Ivor: You pursued the path of finding out why and you were successful. For a modern doctor, there’s no way they’re going to have the bandwidth or, in many cases maybe, the expertise to really do that. So, this is where prevention has to get way better, but people need to take accountability and responsibility for their own preventative health, and can’t just depend on a system that will just throw some meds at the problem. Often that will be a very weak intervention, whereas there are far more powerful ones that address the root cause of the problem. Ivor: Interestingly with GGT I’m always getting new data, and here’s a great example, a bit like yours. I had a guy who came to me asking about GGT. He’d gone low-carb and he’d done everything, and he was still extremely high. The doctor kept saying to him, “Are you sure you’re not drinking?” And he was very annoyed because he didn’t really drink any alcohol. So, he pursued it and pursued it and eventually he discovered that he had SIBO, Small Intestinal Bacterial Overgrowth, so his high GGT for over two decades was actually mostly due to that inflammatory problem, and when he got a very strong targeted antibiotic to resolve his issue, his GGT for the first time in 20 years dropped down from super high down to normal range. Ivor: Now, that’s a really special cause, very, very unusual, but this guy found it, and it would have had implications for his health if he had not. Lee: Well, I may be jumping into functional medicine here, talking about Small Intestinal Bacterial Overgrowth, but let me run with it for a moment. There’s been a couple of people who around me, recently where I thought, “Hey, you’ve got SIBO and the doctors haven’t identified it.” So I ordered a test, it’s a two-hour test. You blow in the test tubes five times [per hour, 2 hours, = 10 total], send them back in the post to measure the gases that came out your gut. And both the people that I thought had SIBO did have SIBO, and just to prove to them, we’re all not coming back positive, I also paid, it’s a little bit expensive, and I didn’t come back with SIBO. Lee: SIBO’s an interesting one, and are you aware of the link between SIBO and glucose? As in SIBO can also contribute to higher blood sugars? Ivor: I really feel it’s what you eat over your life that leads to a healthy or a non-healthy microbiome. Lee: Yeah, and it’s also certain agents, like antibacterial agents and exposures when young, basically not eating dirt. But we’re jumping into functional medicine here and I’ve got some other plans to fit this podcast. So, I understand your background is engineering and you’ve came in from outside and taken an engineering approach instead of a medical practice approach. Just to make clear, you don’t have a commercial interest here, that you’re actually sponsored? Ivor: No commercial interest whatsoever. Myself and Dr. Jeffry Gerber released the book Eat Rich, Live Long, which goes through kind of everything, I would say, in March this year, but to be honest any margins on that don’t go within a mile of covering expenses. But I am funded and I work on behalf of Irish Heart Diseases Awareness, www.ihda.ie, and David Bobbett who founded that charity. There was no profit interest whatsoever related to the charity. It’s all to get information out about the calcification scan, to save middle risk people from heart attacks. There’s 4 million [Euros] invested so far by David and the charity, and zero return, and that will continue to be the case. Lee: I understood David to be a wealthy Irish individual who got very angry and he had very good reason for getting very angry with the current healthcare. Could you explain why he was very angry? Ivor: Well, his story is like an extreme, a super extreme version of mine. I only had bad risk markers that were not highlighted and understood properly, and I got angry, would you believe, very angry. But David was far more extreme. He was very health focused. He had six children. He owns and runs a $700 million business, one of Ireland’s largest Irish corporations, and very health focused. Running four times a week on average, super slim, super fit, executive medicals regularly. And he was always told that he was bullet proof. Top 10% fitness for his age, at really low risk of a heart attack. Bulletproof, his doctor said. Ivor: And then he got, by coincidence, a calcium scan in the US, which is one of the most amazing measures of your current atherosclerotic cardiovascular disease and indeed, your risk for all-cause mortality, not just heart attacks. This test showed him he had a 906 score, which meant he was in the worst 1% of heart disease for his age. So his Framingham risk score from the blood tests was around 5%, which is great, and the calcification scan, the CAC score actually said no, you’re at maybe 50 percent or more chance in the next 10 years of a heart attack or death. Ivor: The obviously really made him angry and he began to research it himself. Then, a while later, he discovered that he was actually Type 2 diabetic in a major way, and they had missed that also with the standard blood tests because they never took a post-prandial glucose, post-meal glucose, insulin, any of that stuff. So he realized that the disease driving his heart attack risk, as in diabetes primarily, they’d missed that as well. And in his investigations he just realized, “My God, the medical system could never survive in my business. They are missing some of the most important measures in the world. They don’t even know about them in many cases, and they’re proceeding ahead with these generic risk factor algorithms, and they think that’s good enough when people’s lives are involved? No way.” So he said, “I’m going to change this.” And that’s the journey he’s been on. Lee: I love it when rich, intelligent people get angry, Ivor. Ivor: As do I. This is a case where David has made an absolute commitment to change this on behalf of all the middle risk … particularly middle risk, non-obese non-smokers. The hundreds of millions of people out there who think they’re probably okay, you know, but they’re thin outside, fat inside, they’re visceral adipose-tissue building, they have diabetic dysfunction, and their doctors get a shock when at 52 with three children, they die, and they say, “Oh, it must be genetics.” Well, no, you could have found out a decade before and prevented it [crosstalk 00:17:15]. Lee: And you could have found out for $100 and five minutes. Lee: We’ve jumped ahead to calcium, but let me just clarify for now: David had a CAC score that showed a 75% chance of a heart attack even though he had been to 15 executive medicals very successfully. Ivor: Yeah. The calcium score will show all of the middle risk, and even in his case apparently low risk patients. The calcium scan overwhelmingly will actually show whether they have disease or not, so it sees the disease process directly. It’s not a proxy or an indirect guess using blood test, and there’s a huge distinction obviously. Lee: I can’t help but jump in instead of moving ahead, about what’s typically used today, which is hard not to laugh over. The Framingham questions. So can you just described what healthcare is doing today to assess risk in terms of cardiovascular in particular? Ivor: Yeah, Lee. Well, it’s kind of bizarre to an engineer, but there you go. So, they’ve got a few different risk calculators and they’re trying to make them a bit better, but the classic Framingham is still used, and you’ve got “Do you smoke?” Do you have high cholesterol?” And a couple of different measures used there. “Male or female? Age?” And there’s a few different questions which are based around risk factors that loosely tie to cardiovascular risk. But of course, in huge amounts of cases, the blood measures and the risk factors don’t really line up with the actual level of disease because they’re only guesses, but the calcium scan goes in in five minutes, as you say, and it actually sees the calcification that is the result of disease. Calcification only arises in diseased vessels. It is only there if you’ve got the disease, and the more calcium, the more disease. So it just tells you the level of disease and bypasses all the risk factors. Ivor: The really frightening thing is the largest group of people in the world are middle risk people. So we’ve got low risk people with excellent bloods who generally are probably okay. Not always, but generally. We’ve got high risk people with very bad bloods and they are generally heading for a very bad outcome, but the largest group in risk is perversely and bizarrely the middle risk people, and that’s where most heart attacks actually occur. But the middle risk people are ambiguous. If you go in with a calcium scan on the middle risk people, papers show that you can move 60% of them into higher or lower risk based on the calcification scan. So you can actually put them in their proper box and act accordingly. But sadly the calcification scan is rarely used, and that’s something we’re working to change. Lee: I should probably try and add some context to what you’re saying there, and I think it’s the case, and you can let me know if I’m right, that a third of heart attacks, the first people know about it, well, they’re actually dead from the first heart attack, a third of people, and cardiovascular disease is the greatest killer. So it’s the greatest killer and the first time a third of people know about it is at the point of death. Ivor: Exactly. Other diseases, they generally are diagnosed before you die. Cardiovascular disease is terrible because the first you get to know, as you say, is you’re dead and it’s too late then, and they write it off and say, “Well, that’s not our patient anymore, they’re gone.” But for the individual it really is frightening, especially when there’s a scan there that in the overwhelming majority of cases could have told you in advance and given you a chance. This process of atherosclerosis with a series of targeted nutritional interventions, and maybe some medications could assist, can be tackled. It’s terrible that the people don’t get the chance or choice to find out and do something. Instead, they’ve got these fuzzy risk factors to guess whether they may or may not have a disease. Lee: Yeah, it’s interesting we’re doing a lot of guessing, which leads me to try and get back on track with my questions, preliminary questions, because we jumped to the deep end. Do you think that healthcare, the healthcare that we have today that is the existing industry, do you think it does a good job of prediction and prevention overall? Ivor: Yeah, there’s a reasonable job done because if you put together all of the blood risk factors, on average in a population, when you put them in an algorithm, you do get a fair cut at who’s more at risk, but at an individual level it’s an extremely weak approach, because there are so many individuals who are badly served by it. So I think they’re doing what they can with the way the system has evolved, and the way the system has evolved is we generally look at bloods because they’re cheap and easy. At a population level, they’re reasonable effective, well, if the doctor is very knowledgeable on all these bloods and what they mean. And the system just throws medications at the problem. So it’s a simple system. Quick blood tests and throw the meds at the problem. Ivor: Now, the meds have a place, but sadly now people believe that they’re a major intervention that will save them, and they therefore don’t really investigate or pursue fixing the root causes of what drives the disease. It’s an easy way out for everyone, but the medications have limited success. I mean, even the best trials [of lipid-lowering drugs], you might have a 20% reduction in events, but those 20% of people who don’t get an event on when they would have been due it, they get it a little while later, and the effect on all-cause mortality is very limited from the data. Ivor: So we’ve got a very weak system that kind of weakly predicts who needs treatment, and the treatment are only really medications that, to an engineer, are quite weak interventions, what’s if you went with getting proper scan and finding out your real level of disease, and then you start applying all of the real fixes like lowered carbs, sugars, processed food, magnesium, potassium, many, many other root causes that you can address, then you can get a massive benefit in the long term. Lee: The existing healthcare industry, you said elsewhere, booms if you don’t prevent and you do procedures like stents and bypasses or prescribed drugs, and the business rewards avoiding the root cause and then patching up after events. So it’s a business model issue, right? Ivor: That is one big challenge that’s not a conspiracy, it’s just the way it is for many decades. There is so much money in interventional procedures, particularly in cardiology, that yeah, no one is really driven to prevent. All of the interventional cardiologists, the huge revenue and profits are in patching up, as you say. So, ironically the profit motive goes the wrong way compared to real industry. Like in high volume manufacturing industry you must fix root causes for issues. You cannot afford to patch up for customers products, it’s ridiculous. So they are driven to prevent the cause and enhance the quality of what they’re making, but in medical industry generally the profits and revenue are in procedures in fixes, so that does drive behaviors. Ivor: Now, one exception is theoretically there are profits in preventative drugs, so there is one wing of the medical industry that benefits from “prevention”. But we touched on that. A lot of people are getting medicated who do not really have disease, and people who have disease getting medicated, it’s not an amazingly effective intervention anyway. But just to acknowledge that there is one branch of medicine that profits from, “prevention”. Lee: That’s an issue we can also discuss, but I’ll jump back to another question. So, would you agree that people are dying unnecessarily today and in mass numbers, and for the ones who are not dying, there is a vast amount of unnecessary suffering, I.e. diabetes for example? So in other words, humanity is letting millions die unnecessarily and letting many, many millions suffer chronic disease that’s entirely preventive. Ivor: Yeah, and the two points are true. There are countless people … The Widow Maker movie, which David got commissioned, shows around 4 million Americans have died of heart attacks that could have been prevented since the scan was invented, and around the world, I mean, there’s just countless more. Ivor: So yeah, there are countless people who we could go in and find out they’re at risk and apply proper root cause fixes. There’s not question about that. Then there’s, as you say, the morbidity and the misery. So, Diabetes Type 2 is exploding. No one would argue with that. The predictions are always being upped in the upward vector. It’s just completely out of control and that whole disease drives most cardiovascular disease and death. It drives amputations, retinopathy, loss of sight, peripheral vascular disease, dreadful, dreadful kidney disease. Most kidney disease now is pretty much diabetes-related. Ivor: So you’ve got all these massive morbidities all around the world and yeah, if you moved in with a few root cause fixes and made it clear to people, if you stop eating this and if you stop doing this you’ll be able to greatly improve your condition, like Virta Health are doing and other groups with diabetes, going to lower carb, healthy wholefood diets. Ivor: You could have a huge impact on the world’s misery, but the problem really is that these fixes and these technologies to identify disease are being treated as somewhat unorthodox. Ironically, after 30 years of missing these fixes, the system is now instinctively pushing back against them at every turn. I mean, we saw the other day a massive media blast around the world based on a completely weak associational study with headlines saying “Low carb means you die younger.” And it’s complete junk science, but this huge campaign in the last few days across the world is to tell people that lowering your carbohydrate might kill you. Ivor: Now, these things don’t happen by accident, this is pushback, and at the same time we have fantastic science from many other groups showing that lowering carbohydrate can be hugely beneficial for people with the biggest disease in the world, Type 2 diabetes. But look, we’ve got these headlines. Lee: Can I jump in just to clarify there? When you say lower carbohydrate, you’re not meaning lower the volume of plant-based foods you’re eating, you’re meaning something else? You’re meaning ultra-processed foods? Ivor: Yeah, primarily removing breads and pastas and grain products primarily. You know, ones that excite the gut hormones, GIP, and ones that lead, or tend to lead, to much higher complications in diabetes. It’s not necessarily a plant food versus animal food because you can lower your available carbohydrate that exacerbates diabetes hugely, you can lower it with a very plant-based diet. You remove all the processed, refined foods, remove all the vegetable oils and you can have avocados and olives and lots of high healthy fat, you know. You can have a lot of fish without getting heavily into animal products, fatty fish, and you can eat unprocessed real food carbohydrates. You don’t have to be just eating steaks. Ivor: There’s even an argument and some data that people who have diabetic dysfunction, like David for instance is an example, that eating suddenly very high protein, high fat animal products may not be ideal with certain people with a damaged metabolism, like ApoE4 genotype people who have developed diabetes. It may have been that 30 years ago before they developed disease they could have thrived on certain foods, but there’s some evidence that now some people may be a little sensitive. So, this is not an anti-plant-based diet thing really anymore. This is a lowered carb thing primarily. Lee: A lowered processed food . Ivor: Oh certainly, lowered processed food is an absolute given. Lee: I just want to be clear because I see a lot of value in plant-based eating or eating more plants, and certainly at different stages of life. Or for example if you’ve already had a heart event, then a plant-based diet, as you said, may be more beneficial say, than a ketogenic diet, or you may need more protein as you get older if you’ve not had a heart event. You may want to up your protein to fight against muscle loss, etc. So, it just depends on where you are. So when you say carbohydrate, you’re not meaning eat less vegetables. Ivor: No. Lower carbohydrate does not mean less leafy greens and above-ground leafy vegetables, absolutely. I’m glad you said it. The first step is cut out the processed foods like breads and all these kind of mechanically refined grains and starches that are super glucose and they excite the things you don’t want to excite. Because diabetic people are inherently carbohydrate intolerant. So you need to go for whole plant foods that are in the low-glycemic arena, and that’s a given. No processed foods. The processed foods also have vegetable oils, industrial seed oils in them invariably, and they will also cause many problems over the long term. So, the highly processed, ultra processed foods is the first step to health, and the sugars. Eliminate those. Ivor: And then you’ve got this array of choices. Do I go for a more plant-based diet that’s very high in healthy fats and low-carb, like we described? That’s a choice. Or do I go for a more animal-based diet? And we evolved through the eating of animals, that’s accepted by paleo-anthropologists. That’s a given, and it can be very healthy. But you need to look at your own blood metrics and how much they improve with your chosen intervention. That’s, I think, important, because like in engineering, if you put in a fixed, or maybe many different types of fixes you can choose, it should be a practical fix, it should be a lifestyle you enjoy, ideally. It should be effective, and there you need to measure your bloods over time and check that your intervention is putting all of your blood metrics in the right direction, and not backfiring. Lee: This is why I rotated diets for two years, and I was checking bloods at least every week, if not every day. Ivor: Yes, and that’s the way to do it. Now, unfortunately the great masses of the middle risk, many of them will just want to know what to do and won’t be so hot on this kind of self-experimentation, so I think all we can do is give them the data like we did, myself and Dr. Gerber in Eat Rich, Live Long. We gave all the data and it’s easy to read. So people can just know their choices. Ivor: Now, we do come down pretty heavily on a more low-carb ancestral diet which does have animal products, but we also have a section explaining if your cholesterol jumps up really high on these types of diets, we explain how you can tweak the diet to bring it back down again. Because it’s not right for us to say, regardless of where the science is, we don’t know for sure, it’s not right for us to say that risk factor might jump up over we think they okay. That’s a personal decision for people. They’re the ones who, if they have disease, are at high risk, and they need to make their own decisions. Ivor: So we allow and explain how you can bring your practical counts back down and how you can do more plant-based food or other interventions, if you’re not comfortable, because it is a personal decision. Lee: So what I’d like to ask you is, let’s begin with your statement “Most of us have diabetes.” Can you explain that? It sounds a bit shocking I would imagine, to most. Ivor: Yeah, and it sounds shocking, but the data is there luckily. So essentially diabetes and diabetic physiology is not where they put the bar. Currently they put the bar with blood glucose at a very high level, but that’s very late in the diabetic journey. So they have shown, I have countless papers that, 15 years before a diabetes diagnosis, things have been changing. The much earlier test, the earliest laboratory test for diabetes is actually Joseph Kraft’s post-prandial, post-oral glucose tolerance insulin readings. So, when your insulin begins to rise excessively after eating food, particularly carbohydrate, you’re already essentially becoming an Occult Diabetic, or a hidden diabetic. Ivor: Currently they call diabetes if you’re over 6.5 [mmol/L] blood glucose sustained or Hba1C is high, but that’s very late. The full diabetics in the US are around 12%, 13% [of the population], but the latest figures from the CDC show that around 64% of 45 years or older adults are pre-diabetic or diabetic, and the reality is from what I said a minute ago, pre-diabetic are diabetic, they’re just earlier on their journey. So nearly two thirds of American adults over 45, and it’s middle age and onwards where you got to worry about death, are essentially diabetic. Ivor: Myself and Dr. Gerber believe, and from his patients and other researchers in the field, that if you used insulin, the most sensitive earliest laboratory diagnosis, it contributed quite a bit higher. It could be 75%. That’s essentially the phrase that most of us are diabetic, is based on the data. Lee: Okay, so you’re saying that 65% of Americans are diabetic or pre-diabetic, and if you use more accurate testing, you’d think it would be a little bit higher. Ivor: Exactly, but at the very basic bottom level, and we quoted a study in the book, over 50% of American adults generally have been shown to be pre-diabetic or diabetic, and if you look at 45 years or older, it goes up into the 60s. That’s absurd, that most your population, adult population, the majority share a single metabolic disease. Lee: So the majority of Americans are sick and have a marker [high insulin] indicating that they will be sicker, is what you’re saying. Lee: Yeah, so most Americans have got what you’re calling a diabetic physiology, even if they don’t knowingly they have this diabetic physiology, and it’s putting them at risk of early mortality, Alzheimer’s, cancer, diseases of the liver or it can be some other organs? Ivor: Yeah, absolutely. Fatty liver is an epidemic linked to diabetes. Cardiovascular disease, it’s acknowledged that type two diabetes is one of the biggest drivers of atherosclerosis, it’s massive, and many cancers are linked intimately to hyperinsulinemia, which is Type 2 diabetes. Obesity is intimately linked into hyperinsulinemia and the whole diabetic physiology. Lee: Why are we measuring glucose then? Because what you’re saying is you begin with high insulin, and that’s not getting measured, and then when you’re half screwed is when the doctor notices your glucose is quite high and this is when it begins to intervene. Ivor: Just the way the system works. Glucose was easy to measure many decades ago and the American Diabetes Association always viewed Diabetes Type 2 as a glucose disease. And then as insulin assays got optimized and advanced and we had Dr. Joseph Kraft, with 15,000 people to prove this out with multiple hour insulin assays, it became clear … and the work of [Yallo 00:42:23] and Bernstein, showed that it’s actually a hyperinsulin disease, but the systems were wet up and locked in place and the system wants it to be a glucose disease, and simple glucose measurements to diagnose it. Ivor: If you started using insulin to diagnose Type 2 diabetes, the problem would be just what we said earlier. You’d begin to acknowledge that two thirds of your adult population are essentially diabetic, and they ain’t prepared to go there, because that news is just unacceptable. Lee: The greatest cause of chronic disease and obesity today is high insulin. Ivor: Particularly disease, the relationship with obesity is quite complex. You can remain insulin-sensitive and become very big. It’s called insulin-sensitive obesity, and you actually pack calories very easily into fat cells that are insulin-sensitive and you can grow them really well. But also when you become insulin-resistant and hyperinsulinemic it can drive hunger very strongly and promote obesity. So, there’s multiple cause and effect loops in the obesity-insulin connection that are very complex, but the best thing to say is they are intimately connected together. The best thing you can do for health and for weight control problems and appetite control problems is to get your insulin right down. Lee: And why are doctors not measuring insulin? Ivor: Well, there’s political … it’s maybe similar to the reasons they’re not using calcification scanning. There’s a general disregard and a general working against using insulin in all the medical systems in the world. You can get into conspiracy theories. One reason is it was difficult to measure the molecule and basically like VHS and Betamax video formats, glucose plowed ahead, cholesterol was measured and easy to measure, plowed ahead, and insulin got left behind. Now it’s very hard to get this message into a system that just views insulin as a medication. Ivor: I had a conversation with one very accomplished medical doctor, and when I explained some of the basics to him, he was confused. I realized he knew insulin as a medication for diabetics and he couldn’t understand how I was saying it was a big causal issue, because they just don’t see insulin and measuring insulin as a causal factor in general medicine. It’s only in the published research. Specialized teams realized this. It can’t seemingly get into the system. Ivor: Yeah, that’s essentially it, and there’s an interview I have free on YouTube with quite a lot of views now. If you look up “Kraft, Ivor,” that’s K-R-A-F-T, and my name Ivor in YouTube, you’ll hit it. It’s Dr. Joseph Kraft, who in the 70s and 80s, with 15,000 people, validated that the earliest laboratory tests for diabetes Type 2 was a post-meal insulin. It’s basically been demonstrated and he published I think in 1978 on this. And Chinese teams more recently have shown the same thing, that the pattern of insulin after a meal or after drinking glucose, can predict future full-blown diabetes to an incredible extent. The reason is, it is type 2 diabetes, just much earlier than when your glucose goes out of control. Lee: So if you really want to do prediction and catch yourself moving into higher and higher risk category, you should be measuring insulin. Now, insulin is something I measure sometimes every week, sometimes every few months, just for the hell of it, and I’m lucky to have access to it. I pay I think 12 euros. Where do you get access to measuring your insulin? Ivor: Right, well, in Ireland it’s actually covered by the public health system. Once you pay 60 euros to go into a doctor, you can to a point ask for certain tests and they’ll be willing to give you them. So, insulin kinda you get for free along with all the other measures [inaudible 00:47:10]. Lee: You pay 60 to see the doctor? 60? Ivor: Well, 50 to 60 is common. Lee: Wow, that’s quite a lot, not by American standards but European standards, that quite a lot to pay to see the doctor. But you ask for insulin at the same time? Ivor: You can, and most doctors will be curious why, but if you explain why, they’ll be fine with it. And in America no one really does it but it’s only $38 I think, and you can do it mail order. In the UK no one will do it, and I believe they will refuse an insulin test. They’re almost anti insulin tests. Lee: So you’re saying the primary root cause of chronic disease, in the UK they’re reluctant to do the test or won’t let you do the test? Ivor: Well, that’s the way it is currently, and again we’ve got to clarify that it’s not that insulin just causes disease, but insulin has a measurement. Hyperinsulinemia has causal mechanisms into increasing your chances of disease, and hyperinsulinemia also reflects other causes of disease. It acts as a marker for other issues. So for instance, if you get very poor sleep over a period, your insulin will rise. If you oxidize your lipoproteins and damage your cholesterol particles, it’s been demonstrated that will drive up hyperinsulin and insulin resistance. Lee: Or you consume too much alcohol or you don’t get enough salt or you don’t get enough sunlight. Ivor: Exactly, to varying degrees, and I always tell people it’s a two-hander. Having high insulin has many causal pathways into dyslipidemia and into disease risk, but also hyperinsulinemia and insulin resistance, if you measure it, can reflect many other issues, because insulin rises in response to inflammatory and immune response. Ivor: To give an example, let’s take our gut microbiome and dysbiosis. They have done human studies where they’ve introduced to the bloodstream lipopolysaccharides, which are bacterial elements that come from leaky gut. By introducing lipopolysaccharides into human, they rapidly rise their insulin and their insulin resistance. So it’s important to remember that it’s not just that hyperinsulin is causal, although it has many pathways. It acts as an incredibly good gauge for some other problem, because it reacts to bad things by rising. So it’s just a beautiful measure to an engineer. Lee: Yeah, I did HOMA myself, because you know, it was cheap, just fasting blood glucose [plus insulin]. But talking of fasting blood glucose, I guess many people when they want to check if they’re pre-diabetic or even diabetic, they would go for a fasting blood glucose test, but you’ve made the case that hey, it misses 90% of people at least, if you were asses them using the gold standard, which is the five-hour Kraft assay. So, fasting blood glucose, to make clear, is missing the great majority of people who are pre-diabetic or diabetic. Ivor: That was demonstrated in Kraft’s work, and even though a lot of his people had diabetic issues, the reality was 90% were not over the glucose limit [OGTT], from the people who failed his proper gold standard [Kraft Assay], like you say. And around 50% who passed a glucose tolerance test [OGTT], which is quite a good test: you drink glucose, you measure your blood glucose for a couple of hours, but around 50% of the people who passed those criteria were still failed based on insulin. So Kraft’s point, yes, was exactly that. We could be getting huge number of people much earlier. Ivor: Now, his fix for people, and he documented it, he would put them on a low carbohydrate diet – this is back in the ’70s – and he would see their post-meal insulin that failed his test, after a couple of months, he’d get them down where they passed it. But he didn’t want to be a diet advocate because there were too many fights about Atkins and he did not want to get caught in the nutritional arguments and politics, so he quietly applied low carb to fix people’s insulin response. Lee: If I jump to chapter 11 in your book, it’s called “Cholesterol …” I like the title: “Cholesterol is a weapon of mass distraction.” Nice title, by the way, Ivor. And then you begin with a quote which is, “Stupidity is the same as evil if you judge by the results,” by Margaret Atwood. So, what do you mean by … can you introduce the concept that cholesterol is a distraction? Ivor: Yeah, I think cholesterol, and again we’ve got to have the caveat up front. Cholesterol and the various measures are risk factors. They can predict a problem in the future, so they’re not nothing. The problem is that the obsession with cholesterol over the past 30 or 40 years at the exclusion of insulin metabolic syndrome, ferritin, GGT, and all of these more important markers, in many ways, that’s where the damage has come in. Ivor: So, there was total cholesterol decades ago, [it] was believed to be a risk factor. Guess what? It got dropped. It got dropped when it became apparent it was ambiguous, misleading, kind of a joke almost. And then LDL the bad cholesterol was brought to the rescue and this was meant to be the super risk factor, you know, the bad cholesterol, and now that’s been dropped from the risk calculators. We talked about the risk calculators earlier. It’s gone. They use the ratios of HDL to total and they use non-HDL. So, LDL has now essentially been dropped from the risk calculators, and I have endless studies that show it’s an extremely weak predictor of [crosstalk 00:53:49]. Lee: But if it’s such a weak predictor, I have to jump in say, but why are we prescribing drugs to the millions, namely statins based upon it? Ivor: Well, the new risk calculators are not based on it. They are based on lifetime risk and overall risk. Now, I know there are many, many doctors around the world who are still just looking at an LDL or even a total and saying, “Oh, I think you should be on a statin.” Technically they’re not meant to. They should be using the QRISK or the ASCVD risk, and they do not use LDL directly. They use ratios and non-HDL and smoking and blood pressure and all these other things. So yeah, doctors instinctively after many decades of this exaggeration of LDL’s role, still instinctively reach for a prescription pad when they see high LDL, but they should not do that. They should be looking at all the risk factors and making a decision based on much more. Ivor: Yes, this has been seen in many studies and it’s a very embarrassing thing. Some arguments against all the studies that show that higher cholesterol, especially in women, links the lower mortality and better health when you’re above around 60, one excuse given is reverse causality, that oh well, people who are ill, it lowers their cholesterol so it creates an impression that higher is better. But that’s been dis-proven in many studies. One particular one was the cancer. It’s known that low cholesterol is a risk and low LDL, for cancer, which is obviously a major thing people want to avoid. It was said that well, sub-clinical cancer can lower your cholesterol, and that’s what’s associating lower cholesterol with cancer. Ivor: But one guy did a study, it was in the BMJ, and he showed that the low cholesterol link to cancer was unchanged and went back 20 years, right, when he looked at the data. So he said this is not reverse causality. The low cholesterol is genuinely, and decades in advance, consistently linked with more cancer. So, put that in your pipe and smoke it. Lee: So LDL is a very poor independent marker. Ivor: Unless it’s really high, in which case you need to go in and look even more carefully at all the other markers to find out what’s going on. Lee: But when you say high, what kind of value are you meaning? Ivor: Well, the really high is over around 200 milligrams in US units [5.17 mmol/l] for LDL alone, is acknowledged to be where it can be more independently worrying, and that’s around over five millimoles for LDL alone. And the director of Framingham, the famous Castelli who was director and cardiologist expert running Framingham many years ago, he did a big paper in ’92, I think. He said unless LDL is above 7.8 millimole, which is around nearly 300 milligrams, he said it has no independent predictive power for cardiovascular disease. Lee: Yeah, and that reminds me, you often talk of the Pareto principle, and you said that the risk ratio you said was about 1.4x, if LDL is over 130 milligram, but insulin in a multi-variate analysis was 6.7x risk ratio. Ivor: That was one particular study, but the trend you will see repeatedly, if things are measured properly and analyzed properly. That study I think was Colombian, it was looking at second heart attacks in the many years following people who had a first heart attack. Lee: Yeah, that’s the one I read. Ivor: Yeah, and in that one, LDL had a 1.4x hazard ratio in the univariate, or when you just look at these measures on their own, and it was non-statistically significant. It didn’t even pass muster. Hypertension did, unsurprisingly. Lee: Only just did. It was like 1.9x. I mean, it wasn’t [crosstalk 00:59:14]. Ivor: Oh yeah, it was 1.97x, but it statistically was powerfully real. The 1.9x was statistically real, whatever about whether it was causal. But the LDL failed, and essentially in that paper when they did the multivariate, and they did the mathematical analysis to see well, what seems to be dependent on something else, and what’s really independent? That’s where total cholesterol dropped from 1.5 to 1, and LDL that was 1.4x, they didn’t even quote what it dropped to but it must have dropped to 1 as well, but I think they didn’t want to show that because it’s just too awkward to acknowledge. So, the cholesterol fell away to nothing in significance and insulin rose to 6.7x. Lee: I went to the doctor … I didn’t actually go to the doctor, I went and got blood taken and it showed high blood sugar. Fasting blood glucose was 8.9 in European measurement [mmol/l] consistently every day. I was told I was diabetic, and I made an appointment to see the doctor but it was two weeks away and I hate waiting and I hate queues and I just like to fix things myself. I didn’t know anything back then. So I was told, “Hey, maybe reduce carbohydrates,” so I simply every day, took body measurements because I could easily obtain them walk-in, and I changed what I ate. Lee: Within two months I went from terrible blood markers to normal, to good and then to optimal, and that began to teach me that you could change it yourself by your lifestyle. So, once I fixed the blood sugars, I then began to look at fats. I began to look at lipids, so obviously I began with the standard cholesterol panel. You know, in America, people might test their cholesterol, their lipid panel, they’re recommended once every two years, but I noticed the lipid panel is dynamic. It’s changing weekly and it’s changing according to what you ate the last five days, four days, something like this. I had assumed that the lipid panel would be showing bad cholesterol if I ate fat, but I actually noticed the opposite, that if I ate lots of fat my standard cholesterol panel improved, but if I ate lots of carbohydrates like bread, my cholesterol panel went bad. Lee: So, do you agree that the lipids are dynamic? And again, why is a doctor measuring every two years? Ivor: Yeah, well, big points there. Yeah, I think cholesterolcode.com is one place we could look at all of this stuff being done, by Dave Feldman, but that’s for people who are interested in these questions. But at a more general level, what’s known for a long time in studies, if you fast, your cholesterol LDL will go up, your particle counts will go up, and like you say, these so-called risk factors will get worse when you fast, which we know is a good thing to do. It doesn’t make sense, right? Ivor: But the reality is that the lipoproteins, the LDL, low density lipoprotein, they travel around the body in their trillions carrying cholesterol and triglyceride, and they have a dual purpose. One purpose, the primary one, is to transport triglyceride for energy purposes, in VLDL and then that gets metabolized down to IDL and LDL. So, primary job is transporting fats for energy, healthy energy. And the secondary job is the lipoproteins also carry cholesterol, and that can be used if necessary in certain places, okay. Ivor: But the problem is as you described. If you eat quite a lot of fats for many days, your body switches more to fat metabolism, especially if you’ve been low carb in general, and you may have more bouts, a rising number of LDL particles as your transport of fats around the body becomes increased. That’s not necessarily a bad thing but it’ll look bad to the doctor. But most people, and we’ve got to be really careful here, people who are low-carb keto and who do some of these interventions can make their cholesterol panel appear worse when really they’re healthy, but they’re a minority. The vast majority of people out there, the people who are at most risk of heart attacks, those people are diseased with diabetes and other issues, and those people generally, a high particle count or small dense LDL actually reflects their insulin resistance and their problems. Ivor: So yeah, I’d agree for sure that if you go in with a specialized healthy diet, even if it’s high in fat and low in carb, you may get bad-looking markers for a different reason than the markers usually indicate – something bad. And most doctors, should I say 99.999%, will not know about what we’re talking about. Lee: Yeah, so Ivor, if I can add onto that. I got worried because my LDL went higher, but the HDL went higher and the triglycerides went down, and the ratios, which are the most important thing you can derive from a standard cholesterol panel all got magically … got into very good levels. But the LDL was so high I still worried quite a lot, so what I did was I went for a Lipoprint, which is, you know, you tend to see this in continental Europe. It’s high-resolution analysis, something semi-equivalent as NMR in the United States. And when I did that, I could see that it was not small dense LDL. Ivor: Yeah, and that is a great way but the vast majority of people won’t really get to access those advanced tests, but for the discussion, yes. One thing you can do for sure is the ratios from the classic panel will give you much better insights than the LDL figure alone. Ivor: Yeah, triglyceride divided by HDL, so if you’re in milligrams American, being less than two in that ratio is called good. I’d like it down below one or 1.2. And in millimoles it’s a different measurement. So European millimoles you want to be below one, or below .9 ideally, or much lower. Lee: Ivor, maybe it’s kind of geeky and it was a little bit expensive but for fun, what I did was I kept taking the high resolution lipids, which were again sent off to Germany, and what I would do is I would micro-change my diet. So I would add bread into my diet, just every day some bread, and very high quality bread, I might add, and I would actually see the small dense LDL increase. Ivor: Yeah, well generally speaking, mixing refined carb and fat, I know it’s high quality bread, but let’s be honest, most breads, even high quality, are still mechanically refined carbohydrate, which is not ideal in general for humans. If you ate the actual wheat and ground your teeth through the whole grains untouched, it would be less bad again. But generally speaking, that kind of diet increases small dense LDL. Generally speaking, in the vast majority who are metabolically deranged, a higher carb mixed with fat diet will, of course, exacerbate their insulin resistance and that will lead to higher particle counts and more small dense LDL and higher triglycerides. Ivor: So in general yes, that mixture of refined carb and fats is the least optimum mixture, but if you eat mostly healthy fats and low carb and certainly low refined carb, you’ll tend to get the best profile, but it doesn’t mean your LDL will be the lowest. I mean, if we consider an irony: if you eat more vegetable seed oils, which we would all agree are very unhealthy in the long term, because of how they function in the body you will lower your LDL and that will look good. So, the LDL measurement alone is very ambiguous and a very risky one to stake your life on. Lee: Before we jump ahead and speak about healthy eating, I just want to make clear that you get plenty people who look healthy but are unhealthy. Do you want to briefly introduce the four classes of body fat? Ivor: Yeah, this is close to my heart and to David Bobbett and the IHDA. In summary, we are most concerned really about … I give a statistic. The top 10% of people in calcification scores account for over 40% of the heart attacks and deaths. So, a major thing is to know your calcification score. The people who are high in calcification score are the massive area of people at risk. Now, within that, those people, you’re going to have people who are very obese, who are eating dreadful diets, you’re going to have smokers, and you’re going to have a whole load of people who kind of know they’re doing the wrong thing, so they know they’re heading for trouble. Ivor: But what’s really frustrating are the people as you describe, who are apparently not obese, they don’t smoke, but they’re at just as high risk. So the four types of people: insulin-sensitive normal weight, or metabolically healthy normal weight, MHNW, and these are the people you want to be. They’re insulin-sensitive, they’ve got great hormonal and metabolic health, and they’re not greatly overweight. Perfect, they’re very low risk. Ivor: The second type of person is the really problematic one. It’s metabolically unhealthy, normal rate, or TOFI, thin outside, fat inside. These people are the tragic ones. They’re not greatly overweight, they think they’re healthy eating their heart-healthy whole grains and heart-healthy vegetable oils, and they think they’re doing fine. But guess what? They’re hyperinsulinemic, insulin resistant and they’re on fire inside. The calcification test would warn them in advance or if you measured post-meal glucose and insulin you’d get an insight but their doctors not really looking. Their doctor’s looking at their LDL and often these people have an okay LDL so they don’t get the warning. When they die, it’s a big mystery. That group is the crucial group, hundreds of millions of people around the world that we’d be most concerned about. Ivor: The third group is the metabolically unhealthy-obese. Now, they’re the classic people who are very obese and they are dreadfully insulin-resistant, but like I mentioned a few minutes ago, they know they’re at risk, because everyone knows if you’re very obese you’re probably at high risk. So at least they know. The fourth group are very interesting but we’re not saying that it’s okay to be in this group, but they are the metabolically healthy obese, and they are actually insulin-sensitive obese. They’re really obese, you can be up to 40 BMI, but they’re actually insulin-sensitive and they do not carry anything like the risk for disease that even the slim insulin-resistant people do. Ivor: So they’re a very unusual subset of obese people who, their body has been able to expand their adipose sites, make more fat cells and keep expanding, expanding, expanding the fat without breaking down and becoming insulin-resistant. They have a very high personal fat threshold. So, those people I’ve just described, they have a very high threshold, they can keep getting bigger and bigger and bigger without their insulin going out of control, right? And on the other extreme you have people who cannot expand their fat, they’ve got a very low personal fat threshold. They’re the TOFIs or in extreme cases, people with lipodystrophy who cannot make more fat cells, and nearly all of those people are automatically diabetic. So, they illustrate the other corner case. The people who cannot make fat, who are painfully skinny, they’re all diabetic. Lee: Yeah, so you actually know just looking at people, when it comes to people and both have say a beer belly, you can actually visibly see the difference in the fat. Would you agree with that? It’s a different type of look. Unfortunately I’m the bad fat look if I get a beer belly [unhealthy-obese]. I’m not sure if you’re aware of what I mean, it’s a physically different droop to the stomach. Ivor: Yes, I have a paper actually that has photos of all the guys, and it was called Insulin-Sensitive Obesity. That’s the title of the paper if people want to Google it. Lee: Yeah, it sounds kind of silly that you can see if it’s a good fat or a bad fat when it’s just two fat people with a beer belly, but it’s got a particular type of style to it when it’s bad or it’s good, but you can actually measure it, like in the US with directlabs.com, and you measure two hormones, the serum adiponectin and leptin. So you can tell if you’ve got good fat or bad fat. Ivor: Absolutely. So, two things. In this study I mentioned, the photos first. Yes, the insulin-sensitive obese who are relatively quite healthy, their fat hung in big folds over their belt and it was mostly subcutaneous adipose tissue external to their muscle wall, hanging in huge reserves of floppy fat. And it was actually healthy cells. Ivor: The insulin-resistant obese had a very different look. They were also really big, like 35 plus BMI, but they had a stretched potbelly and actually they had quite a lot of visceral fat behind their muscle wall in and around their organs, and they have a more stretched look, not a big floppy. But if you take someone who’s only 27 or 28 BMI, it’ll be even harder to see that difference. It’s easier to see in really big people. Lee: What was interesting was when I was diabetic I went for imaging, and I had seven kilos of visceral fat. Within six months of being low carb keto there was no measurable visceral, which was outstanding to the person doing the imaging. He was almost jaw-dropped. Ivor: Exactly, Lee, because they will never usually see that, because the intervention for this problem, the orthodox intervention, is low fat diets and vegetable oils, which will probably just hasten your demise. So they’re just not used to seeing fatty liver and visceral fat depots disappearing in months, but we have countless examples of this now. It’s just the orthodoxy just doesn’t know what to say. I have a relation who was diagnosed with fatty liver. I told them, “In the next month before you go back to the doctor, do this.” And of course it was a healthy, high healthy fat, very low-carb diet. Cut out all the fruits and all the other stuff. Do an extreme intervention for a month just to shock the doctor. And he went back in and doctor was completely confused looking at the latest bloods. He just could not understand. Lee: Yeah, I saw the professor who as doing the imaging thinking that their assistant hadn’t set up the imaging machine up correctly. Ivor: Yeah, and that’s what you’re going to see. “It must be the machine.” But the big thing is the revolution that’s coming, because with the internet and this knowledge that we’re speaking about, and Virta Health and the work of Professor Volek and Phinney, and countless other leaders in the new science. We’re going to begin to see scans like that popping up all over the place, and that’s going to convert the medical orthodoxy. Lee: My opinion is we’re going to see new healthcare emerge, which is why I started this podcast, because there’s other pressures and other factors and other technologies coming into play, so I actually think today’s healthcare will be left for the sick and injured and we’re have a new healthcare for prediction, prevention and optimization. Prevention and prediction isn’t very good today. Do you agree that government nutritional guidelines have been based upon junk science and have only exacerbated chronic disease and obesity? Ivor: Broadly speaking, yes, one would have to agree with that because they were heavily based for decades on essentially refined carbohydrate starches, which we know are not a good idea at all. And the vegetable oils, I think the science is now beginning to burgeon and explode around how seed oils and omega 6 and linoleic acid oils are not ideal in the long term for health and have led to many unintended consequences, even though in trials they look good on paper and short term trials, because they nudged cholesterol around. Ivor: So I’d say yeah, the guidelines are going to have to change to lower carb, high healthy fat, or at least take out all the ultra refined processed foods. Breads unfortunately I think, in the food pyramid, are essentially an ultra-refined processed food. Lee: So, the food pyramid is upside down. It should be more oils at the bottom and breads at the op, and cereals at the top, I.e., use sparingly if at all. Lee: Well, you’re in alignment with myself, I did go through phases of drinking oils, but then I was checking bloods and how I felt and I’ve curbed it back again. So, to dispel a myth: eating fat doesn’t make you fat, it’s carbohydrates that make you fat. Ivor: Many things will make you fat and I would say carbohydrates and refined carbohydrates are a big part of the problem, but I just think it’s maybe an oversimplification to just say it’s carbs that make you fat. Carbohydrates, especially as they’re more refined and especially mixed with fatty foods are a very pro-obesogenic factor. If, as is the case now in our population, we have hyperinsulinemic hordes or basically majority with seems like diabetes, for weight loss it’s a disaster to keep eating carbs, refined carbs mixed with fats in the diet for our population. We need to go back to much lower carb to begin to pull back from the precipice. Lee: Yeah, I think if you’re going to go into eating fat, you either should go 65% and above or 10% and lower and nothing in between. So when you see people eating a burger and washing it down with a beer, it’s definitely not helping longevity. Ivor: Yes, absolutely, there’s a lot of evidence for that, and we’ve gone through it in the book. There is a place you can go with very low fat and relatively high unprocessed carb, and we’ve got the work of many doctors, mainly vegetarian, who have had quite good results with ultra very low fat. And there is a scientific set of processes , that if you go really low fat with high carb you can achieve an insulin sensitivity, with quite a bit of care. The reason we go low carb, high healthy fat is it’s a much more delicious, rewarding ancestrally appropriate diet that is much more easy to adhere to and brings other advantages. Ivor: So, the low-carb, healthy fat is really an engineering practical solution to our current population issue. Lee: Okay, and when you say vegetable oils, you’re not meaning olive oil, you’re meaning, Americans would call it canola oil. We’d call it rapeseed oil? I say “we” because I’m kind of culturally confused nowadays. I forget what the British name is. Is that rapeseed oil? What’s that yellow stuff in the big containers that all the restaurants are using that’s poisoning us and many people are using at home? Lee: No, I don’t think it’s urine, but they not only use oil that’s killing us in the cooking, which is one reason I don’t eat out often, and it’s the vegetable oil you speak of. I’m sure Americans call it canola oil, which is slightly different, but we call it rapeseed oil or vegetable oil. Ivor: Right, well, yeah. I would say the vegetable oils or seed oils, they’re not actually from vegetables. They’re crushed at high temperature and pressure, and often with solvents, out of seeds. Canola is one and it was the seed developed to be higher in Omega-3 type fat, rather than too much Omega-6, because they’ve known for decades the omega 6 is a problem. So they’re breeding canola and rapeseed to be higher in the better fats, but the reality is vegetables can be sunflower, soy oil, all of these seed oils are vegetable oils. Canola is just one particular type that they’re trying to make a little less bad. Ivor: They’re in very stark contrast to olive oil, because olive oil is mostly mono-unsaturated oil and it’s crushed from real food, and coconut oil is crushed from real food. The coconut oil and olive oils are all real food oils and they are not high Omega-6, industrially processed extracted from seed oils, so there is a big distinction. It was great to make that. Lee: Thank you, Ivor. I realize we’re vastly running out of time here. Let me hit you with four questions. You decide how long you want to spend on them. You’ve said that the cellular structure of food is what matters, and as soon as you mechanically grind food, that’s when you run into issues. There is something at the cellular level. You can’t just get food and mechanically grind it and then throw fiber in it and fix it again, right? Ivor: Yes. Essentially this has been proven out in many, many studies, human and petri dish and elsewhere. In a nutshell, if you mechanically process and grind up carbohydrate starches, you make them more available to the gut and a hormone called GIP reacts more strongly. So, grinding fats or protein doesn’t make much difference, but plant food carbohydrates it does. So, that’s essentially it, and if you put back in fiber into products where you’ve ground them and taken out the fiber and destroyed their structure, they’ll cause a much higher insulin response, they’ll cause much higher hormonal reactions which in the long term are very negative, and putting back in fiber might mitigate the problem a little, but it doesn’t really get them back to unprocessed, whole carbohydrate foods. Ivor: So, that’s one of the big problems I think in the last 50 years, is that alone. Lee: Okay. Three questions left. What you’re saying, if we sum everything up today, as a practical what to do or what not to do, is what you’re saying is avoid 90% of the supermarket. The supermarket is a place to go to get sickness. Avoid all the middle aisles and only eat around the perimeter, is pretty much a summary of what you’re saying. Ivor: Yeah, I think that’d be a fair summary, that processed foods which fill 80% of the supermarket, be very careful which ones you indulge in a lot. There are some processed foods which are like ready meals, where they’re mostly real food components with some flavorings in a tray. But you’ll find they don’t keep so long. But all the sauces, the powdered soups and all the cereals, I mean of course, and all of the food is generally high in mechanically ground carbohydrate and high in vegetable oils, and they’re two big bad actors. If you go round the outside and you eat just vegetables and above ground leafy vegetables and peppers, of course the grass-fed meats, the fatty fish, the eggs, avocados, I could go on and on. They’re all real foods, and unless you’re already diabetic with a broken machine, in which case you need to be particularly careful even amongst some real foods, generally speaking the real foods will not cause much of a problem for you. Lee: So the last question is, essentially do you think we should just eat like 1860? Ivor: Essentially yes, 1860 … Well, a lot of people didn’t have access to good nutrition, but generally speaking it was pre-sugars, pre-refined carbohydrates, certainly pre-vegetable oils. So if you take those as three of the baddest actors, back in the 1850s, once you had access to plenty of food with nutrition, look meats and whatever, generally speaking, yes. The diseases of modernity exploded in the 20th century, and they did so primarily because of the changing food supply. Not exclusively, of course, but that’s a really big Pareto item. Lee: I can’t help but throw this in real brief. Public health got it wrong on cholesterol, they got it wrong on fats, they got it wrong on salt, they did get it right on smoking. If you tossed a coin on these items, you would have had more chance on getting it correct. Ivor: The new foods that were high profit center, high revenue and practical to feed the world, all the new foods that were most economical, most profitable, when they turned out to be a problem, they had to be defended. I think every little driver with everyone who was influential, from industry business and researchers who’d fallen for the cholesterol/heart hypothesis, it just turned out in the 50s, 60s and 70s that everyone ended up with a career or a commercial interest in defending modern foods, and some of the modern theories. So it became self-fulfilling, that we’d always tend to get it wrong, and that’s just human nature and industry and just many other group think and all this kind of stuff, I don’t think it’s a major conspiracy, but I think industry certainly dropped a lot of money into keeping the paradigms as they were, and they still are to this day. Lee: Well, Ivor, I highly appreciate your time. I do apologize for over-running because you did tell me you have a hard stop, and I super hope to get you on again in the future because there’s just vast amounts we didn’t cover that I think is essential. Ivor: Oh absolutely, we’ll come back again, Lee, and I’d probably just finish on again, because I work on behalf of IHDA, just for people to keep in mind the top 10% of calcium scores have more than 40% of the heart attacks and death, and those people need to really, really focus on their diet and all the fixes we were talking about there. Lee: Where can people get CAC scores? Ivor: If you Google Widow Maker CAC, that’s two words, you’ll get to watch The Widow Maker movie which explains all of this, and my name Googled or searched on YouTube, I have many lectures and interviews on this whole area. But generally speaking, you inquire in local hospitals or scanning centers and ask about the CAC score from the CT scan of the heart, and you have to shop around. Lee: I know in New York you might get it think $100, but what about in Europe? Ivor: Europe, generally more expensive for sure, but it will vary greatly. I think you just got to go and ring around. Lee: Okay, well hopefully we can find some links on them over time. I wish you a successful day, Ivor, and I greatly appreciate you giving up so much of your day. Ivor: Thanks a lot, Lee. Best of luck. Lee: Thank you, take care.